If you have an audio input device, you can record synchronized audio along with motion capture data in Motive. Recorded audio files can be played back from a captured Take or be exported into a WAV audio files. This page details how to record and playback audio in Motive. 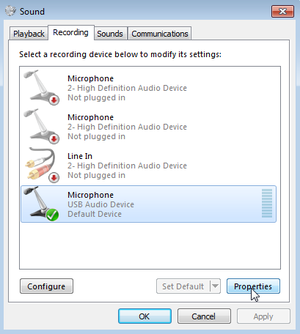 Before using an audio input device (microphone) in Motive, first make sure that the device is properly connected and configured in Windows. In Motive, audio recording and playback settings can be accessed from the Tools tab → Audio Settings. In Motive, open the Audio Settings, and check the box next to Enable Capture. Select the audio input device that you want to use. Press the Test button to confirm that the input device is properly working. 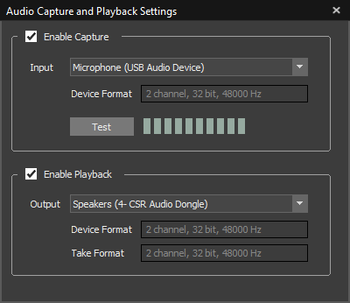 Make sure the device format of the recording device matches the device format that will be used in the playback devices (speakers and headsets). In Motive, open a Take that includes audio recordings. To playback recorded audio from a Take, check the box next to Enable Playback. Select the audio output device that you will be using. Make sure the configurations in Device Format closely matches the Take Format. This is elaborated further in the section below. In order to playback audio recordings in Motive, audio format of recorded sounds MUST match closely with the audio format used in the output device. Specifically, communication channels and frequency of the audio must match. Otherwise, recorded sound will not be played back. The recorded audio format is determined by the format of a recording device that was used when capturing Takes. However, audio formats in the input and output devices may not always agree. In this case, you will need to adjust the input device properties to match them. 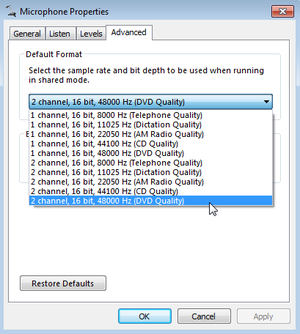 Device's audio format can be configured under the Sound settings in Windows. In Sound settings (accessed from Control Panel), select the recording device, click on Properties, and the default format can be changed under the Advanced Tab, as shown in the image below. Accessing microphone properties from the Sound settings. Recorded audio files can be exported into WAV format. To export, right-click on a Take from the Data pane and select Export Audio option in the context menu. 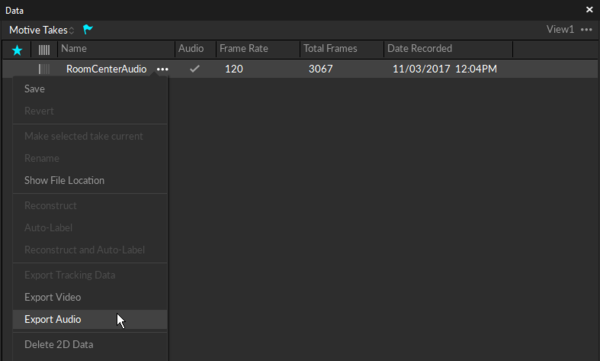 Exporting recorded audio in Motive. If you want to use an external audio input system to record synchronized audio, you will need to connect the motion capture system into a Genlock signal or a Timecode device. This will allow you to precisely synchronize the recorded audio along with the capture data. For more information on synchronizing external devices, read through the Synchronization page. This page was last modified on 24 July 2018, at 18:56.